Consuming less power is responsible and profitable. That is why we are pleased to bring you these residential and commercial Power Factor Correction units. These units are a simple and affordable way to reduce your energy cost by improving your power factor. Savings depends on an each individual's power factor. Consuming less from your utility provider, electric bills will drop by 10%, guaranteed! Power Factor is the quality of electricity that's delivered to your home. For example, a 1.0 power factor means that 100% of the electricity being delivered to your house is being used effectively. The average power factor delivered by utilities range from 0.6 to 0.8. All our models will increase your power factor! 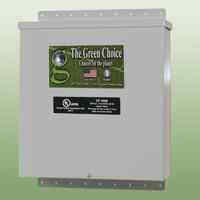 This increases the efficient use of your electricity and lowers your usage. Any motored device will run significantly cooler and consume much less power. All other appliances including stereo equipment, TVs and computers will benefit from cleaner energy. The surge protected electricity also extends their life expectancy.